The cost of dental implant is an issue of serious concern for many patients who need such treatment. It is definitely one of the most frequently asked questions by patients who present for initial implant consultation. The cost of dental implant treatment may vary depending on the complexity of your condition. Factors such as esthetic considerations, jaw bone condition, thickness and health of the gum, number of implants needed, and type of final restoration affect the cost. Because dental implant treatment is quite complex and many factors affect the price, the most logical approach is to have your condition evaluated by an experienced and skilled implant dentist to find out your specific need and best treatment option. Did you know Dental Implant Centers™ offer free consultation and x-ray? To learn more or to make an appointment you may click here or call 866-4my-smile (866-469-7645). If you consider the price a major factor in making the final decision, it would be wise to consider a long term cost analysis of your treatment need. An implant placed and restored properly by an experienced and skilled implant dentist will function for decades with no problem. On the contrary, if the same implant is done without considering all the important details, it will be a constant problem and may have premature failure and loss. The best approach could be to find the most skilled and experienced implant dentist that you can trust and be comfortable with. Such a dentist may have a higher initial price but will definitely complete your treatment with a much better long term predictability and success, and lower overall cost. A well educated patient is usually better capable to do cost analysis of a given treatment. It would be best to learn the basics of dental implant treatment so you can communicate well with your trusted implant dentist. It is not enough to find the lowest price in town, if it doesn’t deliver a treatment with long term predictability. Your cost analysis should always take the quality of treatment into consideration. It is interesting to know that the most confident and skilled implant dentists encourage their patients to get well educated about their treatment. A well educated patient is always much easier to handle. Did you know Dr. James Khazian, at Dental Implant Centers™ is one of very first few dentists in San Diego who started offering dental Implants as best treatment for replacing missing teeth? He has successfully treated thousands of patients during the past 26 years. Click here to learn more about Dr. James Khazian. To learn more about your dental condition and best treatment options, you may take advantage of our free consultation and x-rays offer. This consultation will help you understand what your existing dental condition is and the best and lowest cost treatment option. Click here to make an appointment for a free consultation and x-rays, or you may call 866-4my-smile (866-469-7645). Dental Implant Centers™ offer this great financing option to make dental implant treatments more accessible and affordable. Credit approval is required. To learn more you may click here or call 866-4my-smile (866-469-7645). In recent years Insurance companies have realized the value and importance of dental implants in people’s overall health and well being and are now mostly covering such treatments. These coverage, although limited and conditioned to different rules may greatly help you get the treatment you need and save you thousand of dollars. Our insurance expert at Dental Implant Centers™ can help you better understand your insurance benefits and limits. To learn more you may click here or call 866-4my-smile (866-469-7645). Dental Implant Centers™ is an all-in one provider of advanced dental implant treatments in San Diego. 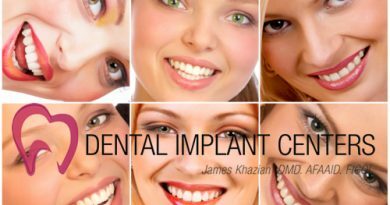 This means all your implant treatments are done in one office by Dr. James Khazian. You avoid the confusion of seeing several doctors and/or different offices. Your treatment, no matter how complex will be started and finished by Dr. Khazian.